CONTRACT-OFFER for the provision of the services of the Individual Entrepreneur Podmarkov Alexander Andreevich (Valid from 12 March 2013, as amended on 09 April 2013 and 27 April 2013, as amended by paragraph 7.1.1.7.1.2.7.1.3,7.1 .4 of October 25, 2013. With the changes in clause 7.1.8 of 06.01.2014, as amended on 01.02.2014, with the changes in clause 7.3 of June 30, 2017). This offer is an official offer of the Individual Entrepreneur Podmarkov Alexander Andreevich (hereinafter referred to as the Contractor) addressed to an any persons (Customers) who accept this offer in respect of provision of services for the search and scanning of archival, declassified aerial photographs (Luftwaffe Aerial Photography and Allied Aerial Photography of the Second World War), which are stored in the archives of different countries and express their intention to conclude an agreement on the offer to provide services to the Executive elem the following terms of this Offer. 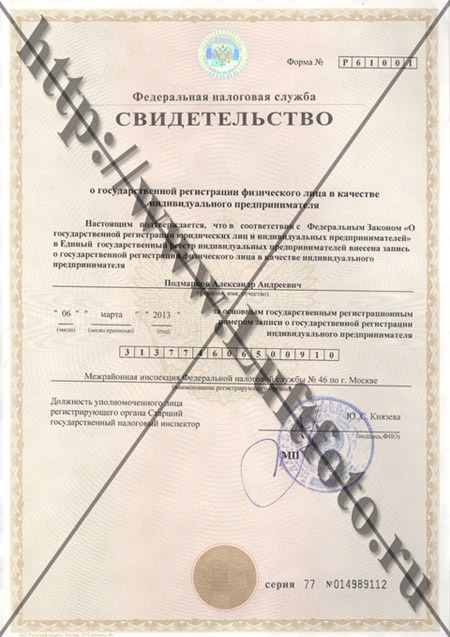 In accordance with Article 438 of the Civil Code of the Russian Federation, the unconditional acceptance (acceptance) of the conditions of this offer of the contract is the implementation by the Customer of payment for the payment of Services and receipt by the Executor of the relevant financial document confirming the fact of payment. 1.1. The offer contract is the present document published on the Internet at http://www.luftfoto.ru/dogovor.html, as well as sent for the purpose of acquaintance via e-mail or provided for the purpose of acquaintance in any other ways. 1.2. "Website" shall mean the content of Internet pages located at http://www.luftfoto.ru. 1.3. Customer - a person who has placed an order for the search of archival declassified aerial photography in archives or scanning of this aerial photography in the corresponding section on the Website (http://www.luftfoto.ru) or by e-mail to deukarten@gmail.com. 1.4. "Placement of Order on the Website" shall mean the process of completion by the Customer of the information required to make an Order. In the course of placing the order, the Customer shall choose the territory in which declassified archive aerial photos (Luftwaffe Aerial Photos and Allies Aerial Photos) of the Second World War will be searched and the time period to be covered by the search for the said aerial photos (Luftwaffe Aerial Photos and Allies Aerial Photos) in the archives. Such time period shall be at least 30 calendar days. 1.5. "Services for the search for declassified aerial photos (Luftwaffe Aerial Photos and Allies Aerial Photos) of the Second World War" shall mean the search for the said aerial photos (Luftwaffe Aerial Photos and Allies Aerial Photos) in the archive and the preparation of a PDF-report (Map of coverage) based on the search results, which report shall be submitted to the Customer in the electronic form to the email address specified by the Customer when making the order. 1.6. "Services for the scanning of declassified aerial photos (Luftwaffe Aerial Photos and Allies Aerial Photos) of the Second World War" shall mean the creating copies of the said aerial photos (Luftwaffe Aerial Photos and Allies Aerial Photos) by converting them into the digital format using special large-format scanner and the provision to the Customer of server space by the Contractorfor a period of 14 days to download the scanned images. 1.7. "The service for binding of scanned aerial photos" shall mean the assignment of GPS coordinates to the scanned aerial photos. The binding shall be carried out using satellite telemetry data, including remote sensing data publicly available on the Internet. The quality of such data is directly relevant to the accuracy of the coordinates assigned to archive aerial photos. 1.8. "Sortie" shall mean several photos (possibly from 1 to 140-300 depending on the size of the territory chosen by the Customer and the availability of photos in the archives) made by one airplane during a flight over the territory and during the time period indicated in the Order by the Customer. The photo Sorties included in the report shall be limited to the zone chosen by the Customer. 1.9. The Contractor is not an archive that keeps aerial photos or any other archive materials. 1.10. The Contractor provides advisory services for the search and scanning of declassified aerial photos (Luftwaffe Aerial Photos and Allies Aerial Photos) of the Second World War in archives around the world. 1.11. The Contractor does not promote any political or other views. 1.12. "Aerial photos" shall mean declassified aerial photos of the Second World War in archives around the world. 1.13. "Business Day" shall mean any day except for Weekends and Public Holidays in the Russian Federation. 2.1. The Contractor shall render the Services to the Customer and the Customer shall pay for such Services. 2.2. The Contractor shall render the Services for the search and scanning of declassified Aaerial photos (Luftwaffe Aerial Photos and Allies Aerial Photos) of the Second World War, stored in archives around the world (hereinafter referred to as the “Services”). 2.3. The Contractor shall render the following Services to the Customer: Assignment of GPS coordinates to the scanned aerial photos (Luftwaffe Aerial Photos and Allies Aerial Photos) of the Second World War from archives around the world. 2.4. Compliance with clauses 4 and 5 hereof and their sub-clauses shall be a necessary prerequisite for the rendering of the Services by the Contractor. 3.1. The Contractor shall search Aerial photos (Luftwaffe Aerial Photos and Allies Aerial Photos) within the time terms specified herein, prepare an electronic report on the obtained Aerial Photo sorties based on archive materials and send such report to the Customer by e-mail. 3.2. If the Customer places an order to scan Aaerial photos (Luftwaffe Aerial Photos and Allies Aerial Photos) indicated in the report of the Contractor, the Contractor shall scan Aerial photos (Luftwaffe Aerial Photos and Allies Aerial Photos) within the time terms specified herein. In addition, the Contractor shalland provide the Customer with copies of Aaerial photos in the electronic format (by sending the links for downloading Aerial Photos to the Customer’s e-mail) using its own server space on the Internet for a term of 14 calendar days. The Customer shall receive download links by e-mail. 3.3. If the Customer places an order for the assignment of GPS coordinates to the scanned aerial photos (Luftwaffe Aerial Photos and Allies Aerial Photos), the Contractor shall make, using telemetry satellite data, including remote sensing data publicly available on the Internet, MAP and GeoTIFF files that can be opened with the PC version of Ozi Explorer or the other software for the GeoTIFF files, unless otherwise agreed by the Parties in a supplementary agreement. The Contractor can make files for other software products and GPS devices for additional remuneration if so agreed by the Parties in a supplementary agreement. The Contractor shall not advise the Customer on the software products and GPS devices for which the Customer has ordered the GPS assignment files. The Customer is liable for importation of the files into GPS devices and interpretation of the results of GPS assignment of archived aerial photos. It is understood that the Customer is acquainted with PC version of Ozi Explorer or other software, for which Customer will order GPS binding. The accuracy of the assignment of GPS coordinates to the archived aerial photos is directly dependent on the quality of publicly available telemetry and remote sensing data. The Contractor shall also provide the Customer with final GPS assignment data for the PC version of Ozi Explorer in the electronic form using its own server space for a period of 14 calendar days. The links for downloading of the said data shall be sent to the Customer via email. The possibility of providing that service is determined by the Contractor independently, after when the corresponding order will be placed. If it is impossible to provide the service, due to the lack of high-quality satellite coverage in open sources, or if there are defects on the archival Aerial Photograph that impede the provision of the service, the Contractor has the right to refuse of the providing of the service to the Customer, and send an appropriate notification to the Customer by e-mail specified during registration Contractor's Website. 3.4. At the stage of placing the order, the Contractor shall offer the Customer to choose a tariff for the preparation of the report and the search of aerial photos. 3.5. The Contract shall ensure that the Customer receives information about the progress of its order on a Website or by email within 2 Business Days upon the Customer’s request. 3.6. The Contractor may change the tariffs for the Services unilaterally at its own discretion. The Contractor shall notify the Customer of any tariff changes by publication of the respective information on the Website or sending an email notice notification to the Customer’s email at its own discretion. New tariffs shall apply to the Services ordered and paid by the Customer upon the date when the changed tariffs come into force.In case of a tariff change in relation to already paid Services, the Services will be rendered in accordance with the tariffs effective as of the Payment Day. 3.8. The Contractor has the right to temporarily suspend the provision of the Services to the Customer for technical, technological or other reasons interfering with the provision of the Services, before such reasons will be eliminated. 3.9. The Contractor not undertakes to advise the Customer upon its request on the provided Aerial photos and/or rendered Services. 4.1. The Customer may place an order according to form provided on the Contractor’s Website. 4.2. The Customer may request information about the progress of its order by completing a form in the respective section of the Contractor’s Website (Member Area). 4.3. The Customer shall make an advance payment for the Services rendered by the Contractorin accordance with the Contract. 4.4. If the Contractor is unable to render the Services due to the lack of required archive materials, the advance payment shall be either returned to the bank card, from wich order was been paid or set off against any future orders at the Customer’s discretion. 4.5. The Customer shall independently and at its own expense resolve any issues relating to the use of copyright and associated rights in connection with the placement of the materials provided to the Customer by the Contractor. In case of any third party or right-holder claims against the Contractor, the Customer shall settle those independently subject to the reimbursement of the Contractor for any losses. 4.6. The Contractor shall not be liable for data on the Customer’s orders used by the Customer and provided by the Contractor. The Customer determines the scope of application of the data received from the Contractor at its own discretion and is fully liable in case of illegal and other actions If the third parties place demands, claims and/or suits against the Contractor concerning illegal exploitation of the materials by the Customer, the Customer settle these demands, claims and/or suits by itself and compensate the Contractor for all losses. 5.1. In order the Contractor to render the Services hereunder, the Customer should undertake the obligatory procedure of placement of the Order on the Contractor’s Website at http://www.luftfoto.ru/lk/poisk.html and/or http://www.luftfoto.ru/lk/orders.html. When Upon Placement of the Oorder is placed on the Website, the Contractor informs the Customer via e-mail on possibility towhether th render the Services may be rendered and issues an invoice for advance payment by e-mail. 5.2. During placement of the order in on the appropriate section of the Contractor’s Website, the Customer should specify a minimum time period to be covered by the search for the period for searching of Aerial photos (which shall be at least 30 calendar days). 5.3. The Customer may specify the period for searching of Aerial Photos as less than 30 calendar days if the archived materials are not available for this period in the territory specified by the Customer. The money are returned or reallocated to the other Customer’s order with deduction of 50% of the total advance payment in case of such Customer’s demand. 5.4. The search for Aerial Photos (Luftwaffe Aerial Photos and Allies Aerial Photos)Services are deemed successful rendered and shall be paid in full if the Aerial photos falling in the time period specified by the Customer during Placement of the Order on the Website are found and any parts of the of the territory specified by the Customer, in any way are covered by them. 5.5. The Contractor does not guarantee availability of specifical objects in the scanned Aerial photos. 5.6. The following information shall be specified within the report on the obtained Photo series as prepared by the Contractor based on archive materials and send to the Customer in PDF format via e-mail: In case of usage of the archived documents, the following is specified in the report submitted by the Contractor to the Customer in PDF format: approximate arrangement of Aerial photos complying with the Customer’s requirements which covered the area marked by the Customer during placement of the order, taking into account the period specified by the Customer during placement of the order, date of shooting, approximate scale of originals of Aerial Photos (Luftwaffe Aerial Photos and Allies Aerial Photos), data on quality of the Aerial photos, cloud and snow cover if there are any in the archived documents. 5.7. The Customer selects the Aerial photos and places an order for scanning of Aerial Photos (Luftwaffe Aerial Photos and Allies Aerial Photos) based on the Contractor’s report. In order to place the order for scanning of declassified Aerial Photos (Luftwaffe Aerial Photos and Allies Aerial Photos) of the Second World War in archives around the world, the Customer shall fill in the appropriate form on the Contractor’s Website by clicking the appropriate link on the Contractor’s Website. 5.8. The Customer can order scanning of Aerial Photos (Luftwaffe Aerial Photos and Allies Aerial Photos) in any amount and at any time after receipt of the report prepared by the Contractor. 5.9. The Contractor advises on the scanned photos only at its own will. 5.10. The Contractor has a right to refuse to execute the Customer’s order without assigning any reasons until the Customer makes an advanced payment. 5.11. Since data on arrangement of Aerial photos, quality of Photo Sorties, cloud and snow cover as well as scale are taken from the sources prepared in the archive, the Contractor is not liable for their reliability. The Contractor can check information for each specific Aerial photo at additional charge. 5.12.1. If the original archive material has defects or is damaged, the Contractor does not bear any responsibility. 5.12.2. The scanned Aerial photos are not replaced at any error in their arrangement in the report if they cover any part of the area specified by the Customer or are located within this area. 5.12.3. The Aerial photo(s) are replaced with others if according to the Contractor’s report it (they) are located within the area, specified by the Customer’s or cover it partially in the Contractor’s report, but it (their) actual arrangement of the Aerial photo(s) excludes partially coverage of the area specified by the Customer by this photo (these photos) or it (their) location within the Customer’s area. 5.12.4. The Aerial photo(s) are replaced only in case set in clause 5.12.3 hereof. 5.12.5. In the case when the digital copies ordered by the price within the clause 7.1.5.1., hereof, any replace or refund for the ordered exposures is not suitable. Electronical copies of exposures will be provided "AS IS". 5.13. In case of order to search/make the report on 1-5,6-10,11-15,16-20 series, the search/drawing up of the report will be performed only within the limits of the specified number of series. The minimum number of series in the report for each rate is the least number in the rate. 6.1. The term for rendering the Services for the search of declassified Aerial Photos (Luftwaffe Aerial Photos and Allies Aerial Photos) of the Second World War in the archives and preparation of the report by the Contractor is 7 Business Days except for Weekends and Public Holidays in Russia. 6.2. The Period term for rendering the Services for the scanning of declassified Aerial Photos (Luftwaffe Aerial Photos and Allies Aerial Photos) of the Second World War, ordered by the Customer for scanning is 14 Business Days except for Weekends and Public Holidays in Russia. 6.3. The Period term for rendering the Services for the scanning of declassified Aerial Photos (Allied Aerial Photos) of the Second World War, ordered by the Customer for scanning is 21 Business Days except for Weekends and Public Holidays in Russia. 6.4. The Period for making of preview of aerial photos (Luftwaffe Aerial Photos) is 14 Business Days except for Weekends and Public Holidays in Russia. 6.5. The Period for making of preview of aerial photos (Allied Aerial Photos) is 21 Business Days except for Weekends and Public Holidays in Russia. 6.6. The Period for assignment of GPS coordinates to the scanned and archived Aerial Photos (Luftwaffe Aerial Photos and Allies Aerial Photos) already ordered and scanned for the Customer is 7 Business Days except for Weekends and Public Holidays in Russia. 6.7. Completion of the Services for legal entities and individual entrepreneurs shall be confirmed by the appropriate certificate of the services rendered. 6.8. Completion of the Services for individuals is confirmed by the absent of claims in writing against the Contractor within five days from the last day of rendering of the Services or From the moment of sending of the results of rendering the Service to the Customer. 7.1.1. 53 USD – Search for photos in the archive / drawing up of the report on 1-5 series of Aerial photos within one degree longitudinally and one degree in latitude (a degree square of northern latitude and longitude without transfer of subzones to the neighboring degrees longitudinally and in latitude is regarded). The Final Cost of search and drawing up of the report published in the Customer’s account at the stage of order placement is final in case of finding of the number of series specified in the rate. 7.1.2. 106 USD – Search for photos in the archive / drawing up of the report on 6-10 series of Aerial photos within one degree longitudinally and one degree in latitude (a degree square of northern latitude and longitude without transfer of subzones to the neighboring degrees longitudinally and in latitude is regarded). The Final Cost of search and drawing up of the report published in the Customer’s account at the stage of order placement is final in case of finding of the number of series specified in the rate. 7.1.3. 159 USD – Search for photos in the archive / drawing up of the report on 11-15 series of Aerial photos within one degree longitudinally and one degree in latitude (a degree square of northern latitude and longitude without transfer of subzones to the neighboring degrees longitudinally and in latitude is regarded). The Final Cost of search and drawing up of the report published in the Customer’s account at the stage of order placement is final in case of finding of the number of series specified in the rate. 7.1.4. 212 USD – Search for photos in the archive / drawing up of the report on 16-20 series of Aerial photos within one degree longitudinally and one degree in latitude (a degree square of northern latitude and longitude without transfer of subzones to the neighboring degrees longitudinally and in latitude is regarded). The Final Cost of search and drawing up of the report published in the Customer’s account at the stage of order placement is final in case of finding of the number of series specified in the rate. 7.1.5. The Cost of scanning of the archived Aerial photos (paper originals): 40 USD per ONE photo at 1200dpi. 7.1.5.1. The Cost of scanning of the archived Aerial Photos (paper originals), without any replace and refunds, also if the paper original will have any defects, the exposure will be misplaced (will have wrong position) within the coverage report or within the archival reference materials, will have many clouds, will have the wrong date: 20 USD per ONE photo at 1200dpi. This is not suitable for Kaliningrad(Koenigsberg) area and it's vicinity. 7.1.6. The Cost of scanning of German aerial photos and Allied Aerial Photos along the territory of East Prussia, some parts of Europe, Kaliningrad region, Karelia, some parts of Murmansk region, Allies Aerial Photos (paper and/or film originals): 105 USD per ONE photo at 1200dpi. 7.1.7. The Cost of making of photo preview only for the archived German aerial photos along all territories except for East Prussia, some parts of Europe, Kaliningrad region, Karelia, some parts of Murmansk region, Allies Aerial Photos: USD 15 per one photo of 36 dpi and exemplary overlay of the made preview in Google Earth, if possible, with transfer of KMZ file to the Customer for this software. If the Customer orders the scan of the photo which preview has been made, 100% of the cost of preview (10 USD) of this photo will be deducted from its cost(Not suitable for the scanning of aerial expousres by the prices specified in clause 7.1.5.1. of this agreement). 7.1.7.1 The Cost of making of Aerial photo preview only for East Prussia, some parts of Europe, Kaliningrad region, Karelia, some parts of Murmansk region, Allies Aerial Photos: USD 15 per one photo of 36 dpi and exemplary overlay of the made preview in Google Earth, if possible, with transfer of KMZ file to the Customer for this software. Minimal order in this case is 2 previews. 7.1.8. The Cost of binding of GPS coordinates to the archived aerial photos is USD 50 per one photo. 7.1.9. The payment is made at the rate of the Central Bank of the Russian Federation as of the invoice date or at the rate of the Central Bank of the Russian Federation on the next day if the difference in the rate of the Central Bank of the Russian Federation changes more than 1% upward. 7.2. Payment for the Contractor's services under this Agreement is carried out in accordance with clause 7.1. and p.7.3. of this Agreement by transferring funds in the form of a 100% prepayment. 7.3.1. Bank cards: VISA, MasterCard, MIR. 7.4. The Customer does not have a right to make a payment hereunder (as well as accept an offer) to the Contractor from the third parties’s accounts without a written notification of the Contractor and only following Contractor’s consent. 7.5. In case of offer acceptance (conclusion of the Contract) by the person authorized by the Customer, such person shall properly specify in the purpose of payment field on behalf of which legal entity or individual the payment is made. This authorized person agrees and acknowledges that it has all powers to accept the offer (conclude the Contract) and specifies comprehensive and reliable data on the payer and real Customer. 8.1. Except for guarantees directly specified herein, the Contractor does not grant any other direct or indirect guarantees hereunder and directly refuses any guarantees or conditions not specified herein. The Customer has all rights and powers in order to conclude and execute the Contract. 8.3. The Customer determines the list of organizational and software (for PC) utilities to save the received copies of the archived materials, prepared reports and other documents provided by the Contractor. The Contractor is not liable for losses incurred to the Customer because of disclosure of the Customer’s information to the third parties not due to the Contractor’s fault. Faulty operations of the Contractor’s Website caused by errors in code, computer viruses and other foreign fragments of code in the software of the Contractor’s Website, No connection (impossibility to reach, break off, etc.) between the Customer’s server and the server of the Contractor’s Website. 8.6. The Contractor reserved a right to answer the Customer’s questions, including by e-mail within 3 Business Days except for Weekends and Public Holidays in Russia. 8.7. The Customer does not protest against publication of the part of information provided by the Contractor in order to promote his own Website and the Services rendered by the Contractor..
8.8. Neither Party is liable for full and partial non-fulfillment of any obligation if this non-fulfillment is due to such circumstances as flood, fire, earthquake, other acts of God, war or military actions and other circumstances of insuperable force occurred after conclusion of the Contract. 8.9. If circumstances of insuperable force effect for more than 3 (three) months, any Party has a right to refuse to fulfill its obligations hereunder (to terminate the Contract) in accordance with unilateral provisions. 8.10. If the Customer publishes the material prepared by the Contractor, including electronic copies of Aerial photos in mass media or printed products as well as other Internet resources, the Customer shall notify the Contractor of it within 7 Business Days by e-mail (deukarten@gmail.com). The Customer should also provide a reference to the Contractor’s Website (http://www.luftfoto.ru) in the description to the materials of such publication. 8.11. The Contractor has a right to insert an invisible “Electronic Signature” in the image and materials to be prepared by it. This signature allows to identify these materials as belonging to the given Customer. 9.1. Within 5 (five) Business Days After upon completion of the works Services for preparation of the report / scanning of Aerial Photos (Luftwaffe Aerial Photos and Allies Aerial Photos), the Contractor shall draw up and submit a signed Acceptance Ccertificate of the services rendered to the Customer. Suitable only for legal entities and individual entrepreneurs. 9.2. The Customer shall either accept the Works Services hereunder, signby delivering the signed the Acceptance Certificate of the services rendered and deliver one copy to the Contractor, within 5 (five) days after receipt of the Acceptance Certificate, or refuse from not accepting the Services by, having delivering to the Contractored a written reasonable refusal from to acceptance of the Services Works hereunder to the Contractor with the detailed written rationale for refusal within 5 (five) Business Days upon receipt of the certificate of the services rendered. 9.3. If the Customer delivers the reasonable refusal, the Parties shall execute a bilateral protocol within 5 (five) Business Ddays when from the date of receipt of this refusal by the Contractor fix receives this refusal. A a list of shortcomings of the Works Services performed rendered by the Contractor due to which the Customer has refused to accept the Works Services should be included in this protocol. and determine The term for their removal should be also specified. Redelivery and reacceptance of Services shall be carried out in accordance with procedure described above. 9.4. If the Customer does not sign the Acceptance Certificate, all Works hereunder are deemed accepted by the Customer, provided that the Contractor does not receive the written reasonable refusal within 5 (five) days. 9.5. All Works hereunder are deemed accepted by the Customer, provided that the Contractor does not receive the written reasonable refusal within 5 (five) days. Suitable Only for individuals, except for legal entities and individual entrepreneurs. 10.1. In case of any disputes arising in connection with or from between the Customer and the Contractor regarding issues connected with execution of this Contract, shall be settled out of court by means of the Parties will take all measures to settle them by negotiations between the Parties. 10.2. if it is impossible to settle the above-mentioned disputes by negotiation, these disputes should be settled at the court. 11.3. by mail, including return receipt requested or courier service with delivery confirmation. 11.4. In case of the Customer’s unreasonable demands to replace photos / repay money (Customer’s mistake, carelessness, etc. ), the Contractor has a right to suspend the Services in accordance with unilateral provisions. 11.5. If the Customer violates clause 11.4 hereof, the Contractor can render the Services if the Customer pays a forfeit amounting to the cost of preparation of the report on 1-5 series specified herein on the day of the forfeit payment..
12.1. The contract is deemed accepted from the moment of acceptance of this offer by the Customer, by prepayment of the Services, by the payment methods indicated in this Contract to the Contractor. 12.2. The Contract is an offer in accordance with art. 435 of the Civil Code of the Russian Federation and, thereby, the Contractor has a right to revoke the Contract as an offer in accordance with art. 435 of the Civil Code of the Russian Federation. If the offer is revoked by the Contractor during the Term of the Contract, the Services paid before the offer revocation are rendered to the fullest extent, and the balance of the Customer’s money transferred to the Contractor’s account is subject to repayment based on the originals of the appropriate letters of repayment when these Services are rendered to the Customer. The Contract is deemed terminated from the date of revocation. The revocation is made by publication of the appropriate information on the Website or by e-mail. 12.3. The agreement will be concluded for the term of rendering a specific service for the search or scanning of aerial photographs (Luftwaffe Aerial Photography and Aerial Photography of the Allies), under the order number and can be terminated at the initiative of either Party at any time, with a warning from the other Party for 10 (Ten) calendar days prior to termination. In the event of termination of the Agreement at the initiative of the Customer, in accordance with Clause 1, Article 782 of the Civil Code of the Russian Federation, the Contractor shall return to the Customer the funds paid by the Customer to the Contractor under the Contract, less the cost of the services actually rendered. 12.4. The matters not settled by the Contract are subject to settlement in accordance with the legislation of the Russian Federation. Telephone: +7(499)347-73-39 (Russian Speaking only), Monday-Friday, from 10:00 to 18:00 (By Moscow Time).